Week six in the NFL got off to an exciting start in Charlotte when the Eagles and Panthers faced off for this week’s edition of Thursday Night Football. Carson Wentz’s three touchdown passes led Philly to a statement 28-23 road win over the surging Panthers and Cam Newton. The Eagles are now 5-1 and beginning to look like the class of the NFC. The 1:00 p.m. slate of games offered many surprises. Chicago Bears quarterback Mitch Trubisky got his first career NFL win with an overtime win over the Ravens in Baltimore. Connor Barth kicked a 40-yard field goal to earn the victory for the Bears that was set up by Jordan Howard’s massive 40-yard rush. After falling behind 17-0 in Atlanta, Jay Cutler, Jay Ajayi and the Dolphins came storming back for a shocking 20-17 road win over the Falcons. The biggest news of the day came in Minnesota, where Aaron Rodgers broke his collar bone — an injury that required season-ending surgery. Now, the Packers will have to move on with UCLA product Brett Hundley under center. The NFC North is as up for grabs as ever, and expect the Vikings to run away with it behind the legs of running back Jerrick McKinnon. The game between the Lions and Saints in New Orleans looked more like a Big 12 game than an NFL game. Scores seemed to be happening almost every minute in the second half, but the Saints were able to hold off the Lions’ late game push by a score of 52-38. The Jets shockingly gave the Patriots a challenging effort in New York by jumping out to a quick 14-0 lead, but Tom Brady and the Patriots managed to come back and earn the win 24-17. This win put the Patriots at 4-2 and was Brady’s 187th career regular season victory, making Brady the all-time record holder for a quarterback. In Tampa Bay, Buccaneers quarterback Jameis Winston was knocked out of the game with a knee injury and replaced by his backup, Ryan Fitzpatrick, who filled in mightily throwing for almost 300-yards and three touchdowns. Fitzpatrick’s valiant effort, however, was not enough as the Bucs fell to the Cardinals 38-33 in Adrian Peterson’s historic debut. In one of the biggest surprises of the week, Le’Veon Bell and the Steelers marched into Arrowhead Stadium in Kansas City and handed the Chiefs their first loss of the year. 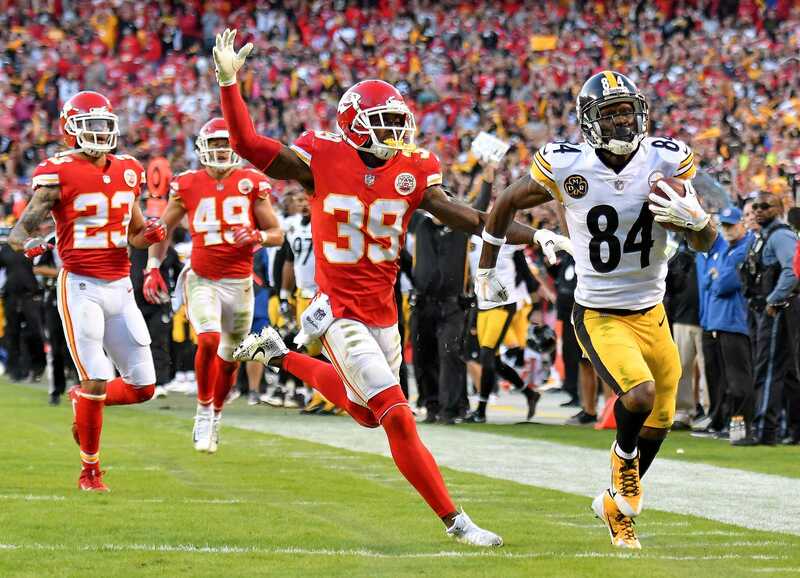 The Chiefs nearly completed an epic comeback, but had a failed attempt on fourth down, deep in Steelers territory in the game’s final minute. With this loss, there are now no undefeated teams remaining in the NFL. On Sunday night, the 0-5 Giants travelled to Denver without their three top wideouts and somehow managed to earn their first win of the year by a score of 23-10 behind the strength of their defense. Monday night was a matchup between two AFC South teams, the Colts and Titans. The Titans ran all over the Colts to a tune of 168 yards and two rushing touchdowns to lead Tennessee to a 36-22 home victory over Indianapolis. Week seven features several pivotal matchups between contenders. The can’t-miss games of the week are the Super Bowl rematch between the Falcons and Patriots in Foxboro on Sunday night and the critical NFC East contest between the Eagles and Redskins in Philadelphia on Monday night.